A lady dressed in the costume of the Heian court sits at a low desk on the verandah of a temple building and gazes out to the full moon as if searching for inspiration. The title cartouche indicates the location as Ishiyama, a small village on the shore of Lake Biwa outside of Kyoto. The main temple in Ishiyama was a popular travel destination for Heian court ladies. 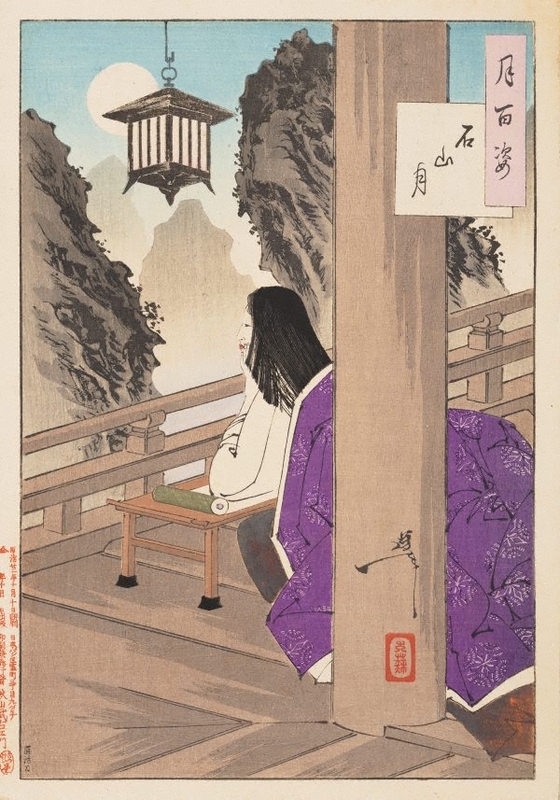 The purple robe of the court lady seen here suggests that she is the 11th-century Murasaki Shikibu (‘Murasaki’ means ‘purple’), the author of Japan’s oldest novel, 'The tale of Genji'. It is believed that Murasaki wrote the story during a sojourn in Ishiyama Temple.